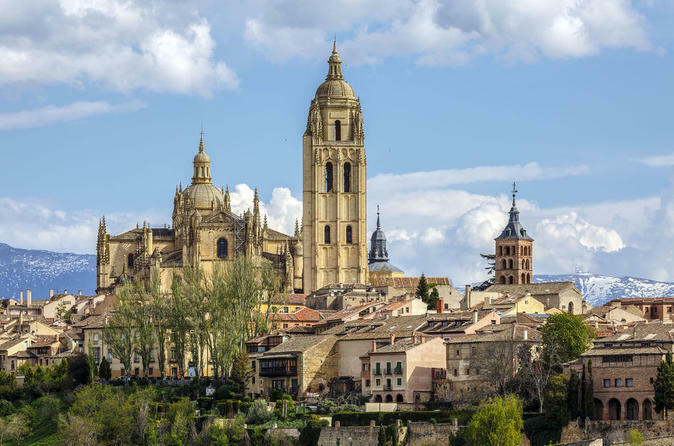 Enjoy this 8-hour guided trip from Madrid to Ávila and Segovia . Heading first to Ávila, meet the most ancient and completely fortified complex in Spain, learn more about Santa Teresa de Jesus and admire several Romanesque-style Churches, Gothic Palaces and the fortified Cathedral from the 12th century. In Segovia, witness one of the best remaining examples of Roman engineering. Explore the monuments of these historic cities at leisure. Explore 2 of the historic cities of Spain by luxury bus tour to Ávila and Segovia of the Castille y Leon. Located approximately 70 miles (110 kilometers) northwest of the Spanish capital, Ávila is completely encircled by 11th-century walls. Upon arrival to Ávila, you will learn about Santa Teresa de Jesus, a great mystic woman of the Roman Catholic Church and also see some of the city. Ávila has the most ancient and completely fortified complex in Spain. Its 8, 200-foot-long wall (about 2,500 meters) and 90 fortified towers surround the old city, which houses a great part of its monumental treasures, including a large number of Romanesque-style Churches, Gothic Palaces and a fortified Cathedral from the 12th century. Then take the journey to Segovia on the luxury bus and get dropped off at the impressive Aqueduct on arrival. Admire one of the best remaining examples of Roman engineering, built over 2,000 years ago to transport water to the City. Go to the visitor center to see a model of Segovia and watch a presentation to help you decide which monuments you want to visit. Declared a UNESCO World Heritage Site in 1985, the buildings of the "Old Town of Segovia and its Aqueduct" include Romanesque Churches and the unusual Fortress of the Alcázar. Stroll down the streets of the Jewish Quarter, where a number of the City's landmarks can be spotted. Experience the spirituality that led Santa Teresa to found a small Convent of Carmelites where the mystic San Juan de la Cruz conducted his first mass.